WPCubed Wordprocessor Demo – see our wordprocessing control in action. Home » WPCubeds developing tool trials » WPCubed Wordprocessor Demo – see our wordprocessing control in action. We created a simple word processor prototype which has been developed with WPTools. It shows the “Premium” features which are also available in our product TextDynamic and allow DocX loading and saving. 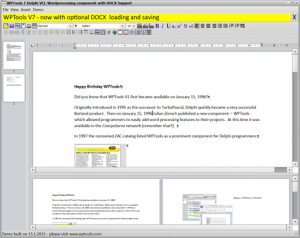 Also included is the PDF export based on wPDF. Uninstall: Access the Windows Control Panel from the Windows start menu. Click Programs and Features and select “WPCubed Wordprocessor Demo” from the program list. Then click Uninstall. The software will now automatically be removed from your computer. Please note that the application was made for demo purposes only, not for real use. It is provided for evaluation purpose only and may not be used in production. This programming sample may only be downloaded from this site. Distribution on other media, download sites, CDs etc. is prohibited.